Education spending = increased wealth in the nation? From The Condition of Education 2011, Indicator 38, Education Expenditures by Country. higher than the OECD average expenditures per student. Per pupil spending in the U.S. is inflated in these comparisons because it includes per pupil expenditures for college. One might make a case that this spending could be reduced and efficiency maintained were investment in elementary and secondary education increased and made more effective. Chiefly, here we should note that spending more on education correlates with a nation’s wealth — the more a nation spend, the wealthier it is, and vice versa. This applies in the developed nations measured by the Organization for Economic Development, anyway. In short: We cut education spending at our national peril. More data on this measure here. Other indicators, and the complete text of the Condition of Education 2011, here. Conflict of interest statement: My office published these reports in my time at the Office of Educational Research and Improvement; I have no affiliation with these data any more. Save Our Schools and other teacher groups organized a march on Washington, a four-day affair to get attention to problems in schools and gain support for education-favorable solutions. Will their voices be heard over the debt ceiling hostage crisis? Is it more than coincidence that many of the politicians attacking education lead the effort to ruin the nation’s credit and sink our economy? Today kicks off the four-day Save Our Schools March and National Call to Action, a gathering and rally in Washington, D.C., organized by teachers who say they are fed up with test-driven accountability for public schools—and, increasingly, for teachers. The group, which maintains that it is a grassroots, from-the-ground-up organization, hopes to send a message to national and state policymakers about their displeasure, as well as highlight a variety of principles for improving public education. The group has developed a series of position papers outlining its views on high-stakes testing, equitable funding for all schools, unions and collective bargaining, and changes to curriculum, among other issues. For the most part, the position papers aren’t yet at the level of detail of formal policy prescriptions, and it remains to be seen whether such proposals will emerge from the gathering. March organizer Sabrina Stevens Shupe said however that policy proposals aren’t necessarily the goal of the events. “What we’re talking about is creating the right conditions, not prescriptive policies,” she said. “There’s no one silver bullet that’s going to save anything,” she added, referring to attempts to craft education reforms for the last 30 years. Watch this blog and our issues page for developments from the movement’s events today and through the weekend. The movement began with a small group of teachers, including Jesse Turner, who walked from Connecticut to the District of Columbia last August to protest the No Child Left Behind Act and Race to the Top. Their efforts predated actions by state legislatures across the country this spring to curb teachers’ collective bargaining powers and tenure, noted Bess Altwerger, a member of the movement’s organizing committee, who hosted a reception for Mr. Turner last summer. She said the shortcomings of the American public education system do not lie with teachers. Eventually, both of the nation’s largest teachers unions threw their financial and philosophical support behind the movement. The American Federation of Teachers and National Education Association have donated about $25,000 each to the effort. The bulk of the rest of the donations have come from one-time gifts provided through the Save Our Schools website. Conference organizers estimated that they’d raised over $125,000. After this weekend, they will have to begin fundraising efforts anew to keep their work going. With some luck, a few thousand teachers will show up. With greater luck, a few thousand other people, concerned parents, perhaps, will join them. In much of the nation teachers are still stuck fighting for jobs. Here in Texas, for example, the Texas Lege didn’t get a budget out until June, including dramatically slashed funding for this coming school year. In some Texas districts we still face layoffs before school starts in just over two weeks. Many of us don’t have clear assignments, and many more of us will lose basics of teaching, like preparation time, breaks, classrooms, paper, books, and pencils. Considering the trouble created by political attacks on education in state legislatures this year, much of the attacks wholly unnecessary, it’s a wonder the teachers don’t show up with pitchforks, torches, and tar and feathers. It’s a crazy world out there. Help make some sense somewhere, will you? Yeah, this video was first created for the April 2 teacher demonstrations in Austin; but the Texas Lege got filibustered at the last minute. Now the Lege is in special, emergency session. They still plan to begin the dismantling of Texas public education. After the Brown vs. Board of Education decision, Texas did not follow the errors of Mississippi, Arkansas and Virginia, shutting down some or all of the state’s schools rather than education students of color. As a result, Texas students leapt ahead of their counterparts in those states. But today, in 2011, the Texas Lege plans two years of budget cuts that will kill Texas education reform efforts and backtrack on 20 years of progress. Teacher groups ask Texas teachers to go to Austin June 7 to protest budget cuts. It may be like Canute speaking to the sea, the Texas Lege is that stone deaf (water deaf?) — but if Texas teachers don’t stand up for education and Texas kids, who is left to do it? Niemöller is dead. Who is left? Generally, Texas school districts need to lock down their school year budgets by about the end of April. Of course, that’s not possible this year. As of this morning, it looked as though the Texas Lege could not agree on school funding, and they will have to return for a special session to set education budgets in June or July. Can you imagine being the budget officer for a Texas school district? But, sorta good news in Dallas: Budget officers, making their best guesses on what will happen, created Budget 5.0 (the fifth iteration of this process — one is usually all a district gets, or needs). Budget Plan 5.0 was presented to trustees today during a budget workshop. The administration is optimistic that this particular scenario, which envisions a $90 million cut in state funding to the district, will be closest to the final budget presented to the board for approval in June. No additional layoffs at the campus level will be necessary. There will not be an additional loss in the number of teaching positions. The early resignation incentive offered earlier in the spring cut enough from the payroll to make any additional loss of positions unnecessary. It must be noted, however, that some reassignments will need to occur to level campuses depending upon staffing needs. Full day pre-kindergarten for eligible Title I students, which has been a priority of the Board of Trustees, will be funded. Certain teacher stipends will be eliminated. Secondary schools will be staffed at a 27-1 class-size ratio, an increase over the current level of 25-1. While this is not ideal, it is preferable to earlier budget versions that included a 35-1 ratio. Texas lawmakers remain gridlocked on the funding mechanism for schools yet have indicated an agreement in principle on the amount that will be available. The latest funding scenarios from the state give the district confidence to move forward with Budget Plan 5.0, with the possibility of some modifications, prior to its approval by the Board of Trustees in June. The bruises from my broken nose are fading — two black eyes eventually resulted — but the smarting remains. Especially I’m smarting because we have been unable to move either of the students to places where they can be helped, and get educated. A good teacher, one we need to have in the classroom, was offered tenure as promised. President Reagan’s Commission on Excellence in Education wrote about a “rising tide of mediocrity” in education. They said that our students’ achievement levels were in trouble, and that it was our own fault. Had a foreign nation done that damage to U.S. education, they wrote, we might consider it an act of war. And so it is that the war continues on American education, a war conducted by home grown . . . administrators, and state legislators. We have met the enemy, Pogo said, and he is us. War on Education: Is your state short-changing your schools? CertificationMap.com, the group that tracks what is required to get a teaching certificate in each of the 50 states, also does information graphics from time to time. 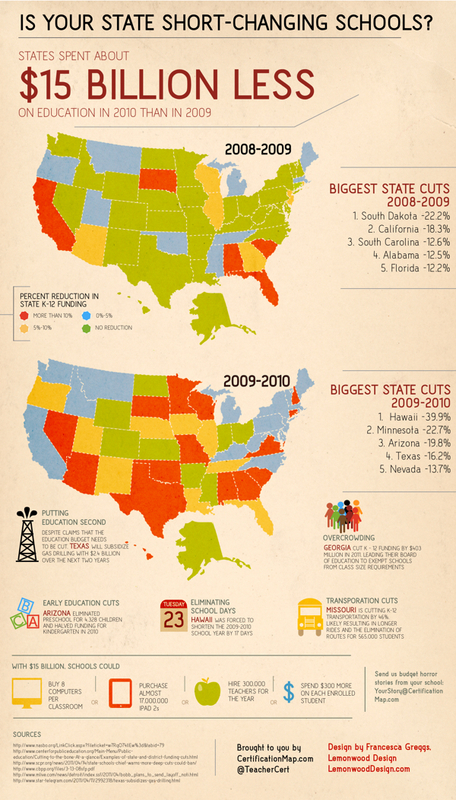 Got this one from them today: A map on how states are spending less on education in 2010 than in 2009. The map should change dramatically when 2011 is taken into account. This map shows $15 billion less being spent on schools nationwide. Texas proposes to cut another $3 billion from spending in Texas alone for 2011. This is a map of the War on Education in the U.S. It shows that education, and the U.S., are losing the war. Click here for larger version of map, "Is Your State Short-Changing Schools?" Are you a teacher, parent or student who has been short-changed by your school? Send us your story at YourStory@CertificationMap.com by Friday, May 13th. In an effort to remind people that the choices we make now will influence our children tomorrow, we’ll be spending Friday the 13th reposting horror stories that illustrate how failing to make education a priority is ultimately failing our own futures. As with global warming, we now have denialists in education issues, those who deny the rising tide of mediocrity, and a few who cheer the rise. Eric Brehm teaches in Wisconsin. Now you know the answers to any questions about bias you may have. It’s been more than three weeks, and Mr. Brehm has gotten no answer from Wisconsin Gov. Scott Walker. It’s not exactly like Walker is a student who hasn’t done his homework, but it’s close enough. It has only been a week, and I grow weary of the political struggle that your Budget Repair Bill has caused. I am tired of watching the news, though I have seen many of the faces of those I hold dear as they march on the Capitol. I am tired of defending myself to those who disagree with me, and even a bit tired of fist-bumping those who do. I am tired of having to choose a side in this issue, when both sides make a certain degree of sense. And so I offer you this desultory (aimless or rambling) philippic (angry long-winded speech), because at the end of the day I find that though this issue has been talked to death, there is more that could be said. And so, without further ado, here are my points and/or questions, in no particular order. 1. You can have my money, but. . .. Ask any number of my students, who have heard me publicly proclaim that a proper solution to this fiscal crisis is to raise taxes. I will pay them. I have the great good fortune to live in a nation where opportunity is nearly limitless, and I am willing to pay for the honor of calling myself an American. Incidentally, Warren Buffett, the second richest man in the nation (and a Democrat) agrees with me. Your proposed Budget Repair Bill will cost me just under $3000 per year at my current salary, with the stated goal of saving $30 million this year on the state budget. I say, take it. You can have it. It will hurt me financially, but if it will balance the budget of the state that has been my home since birth, take it with my blessing. But if I may, before you do, I have some questions. According to the 2009 estimate for the U.S. Census, 5,654,774 people live in the state of Wisconsin. Of those, 23.2% are under the age of 18, and presumably are not subject to much in the way of income tax. That still leaves about 4,342,867 taxpayers in the state of Wisconsin. If you wished to trim $30 million off of the budget, that works out to about $6.91 per Wisconsin taxpayer. So I must ask: Is it fair that you ask $3000 of me, but you fail to ask $6.91 of everyone? I know that times are tough, but would it not be more equitable to ask that each taxpayer in the state contribute an extra 13 cents a week? Would you please, kindly, explain exactly how collective bargaining is a fiscal issue? I fancy myself to be a fairly intelligent person. I have heard it reported in the news that unless the collective bargaining portion of this bill is passed, severe amounts of layoffs will occur in the state. I have heard that figure given as 6,000 jobs. But then again, you’ve reportedly said it was 10,000 jobs. But then again, it’s been reported to be as high as 12,000 jobs. Regardless of the figure, one thing that hasn’t been explained to my satisfaction is exactly how or why allowing a union to bargain collectively will cost so much money or so many jobs. Am I missing something? Isn’t collective bargaining essentially sitting in a room and discussing something, collectively? Is there now a price tag on conversation? How much does the average conversation cost? I feel your office has been eager to provide doomsday scenarios regarding lost jobs, but less than willing to provide actual insight as to why that is the case. I would welcome an explanation. Why does your concern over collective bargaining, pensions, and healthcare costs only extend to certain unions, but not all? Why do snow plow drivers and child care providers and teachers and prison guards find themselves in “bad” unions, but firefighters and state police and local police find themselves in unions that do not need to be effected by your bill? The left wing news organizations, of course, state that this is because these are unions that supported your election bid, while you seek to punish those unions that did not; I would welcome your response to such a charge. You have stated that the state and local police are too vital to the state to be affected. Can I ask how child care, or prison guards, or nurses or teachers are not vital? Again, I would welcome a response. Though you are a state employee, I have seen no provision in your bill to cut your own pension or healthcare costs. The governor’s salary in Wisconsin was about $137,000 per year, last I checked. By contrast, I make about $38,000 per year. Somewhere in that extra $99,000 that you make, are you sure you couldn’t find some money to fund the state recovery which you seem to hold so dear? As you have been duly elected by the voters of Wisconsin, you will receive that salary as a pension for the rest of your life. I don’t mean to cut too deeply into your lifestyle, but are you sure you couldn’t live off $128,000 per year so that you could have the same 7% salary reduction you are asking certain other public employees to take? 2. Regarding teachers being overpaid and underworked. I don’t really have many questions in this regard, but I do have a couple of statements. If you haven’t already figured it out, I am a teacher, so you may examine my statement for bias as you see fit. I admit I find it somewhat suspect that teachers are mentioned so prominently in your rhetoric; those protesting at the Capitol are indeed teachers. But they are also students, and nurses, and prison guards, and plumbers, and firefighters, and a variety of other professions. If you could go back to “public sector employees,” I would appreciate it. But as far as being overpaid and underworked . . . I grant you, I have a week’s vacation around Christmas. I have a week off for Spring Break. I have about 10 weeks off for summer. With sick days and personal days and national holidays and the like, I work about 8.5 months out of every year. So perhaps I am underworked. But before you take that as a given, a couple of points in my own defense. The average full-time worker puts in 40 hours per week, 50 weeks per year, with two weeks’ vacation time. That makes for a grand total of 2000 hours per year. Part of the teachers’ arguments regarding their time is that no one sees how many hours they work at home to grade papers, or create lesson plans, or things of that nature. I am in a rare state, in that I am not one of those teachers. I work an hour from where I live, and I like to keep my work at work. I, therefore, do not bring work home with me, but rather stay at school, or come in early, so that I can grade papers or create lesson plans while at school. So I am more prepared than most to explain the hours it takes to do my job. I also supervise an extra-curricular activity (as many teachers do), in that I serve as the Drama Coach for my school. The school year, so far, has lasted for 24 weeks. I have, in that time, averaged 78 hours per week either going to school, being at school, or coming home from school. If you remove my commute, of course, I still average 68 hours per week, thus far. That means I have put in 1,632 hours of work time this year, which works out to over 80% of what your average full time worker does in a calendar year. If you include my commute, I’m over 90%. If ikeep going at my current pace, I will work 2,720 hours this school year (or 3,120 hours if you include my commute). That means I work 136% to 156% as much as your average hourly worker. As to underpaid — I’m not sure I am underpaid in general, though I do believe I am underpaid in terms of the educational level expected to do my job. I have two Bachelor’s Degrees, and will be beginning work toward my Master’s this summer. By comparison, sir, you never completed college, and yet, as previously stated, you outearn me by almost $100,000 per year. Perhaps that is an argument that I made the wrong career choice. But it is perhaps an argument that we need to discuss whether you and others like you are overpaid, and not whether teachers are. Teachers have been accused of shirking their duties by protesting for what they believe to be their rights instead of being in school. The argument has been, of course, that no lessons have been taught when classes aren’t in session. I must submit that lessons in protest, in exercise of the First Amendment right to peaceable assembly, in getting involved as a citizen in political affairs, have been taught these past few days. The fact that they haven’t been taught in the classroom is irrelevant. Ultimately a very strong duty of the school system is to help students become citizens — I think that has clearly happened this week. As to the legislators, it seems to me as though they feel their constituents deserve to have a length of time to examine the proposed bill on its merits, not vote it straight up or down three days after it was presented. As the current budget does not expire until June, this seems to me like the only response left them in light of your decision to fast-track the bill without discussion. Give them another option, and perhaps they will come back. I can’t say that I agree with their decision, but I can say that I understand it. So far, 12 arrests have been made. Estimates say there were about 25,000 people at the Capitol today, and about 20,000 yesterday. Let’s be conservative (mathematically) and say that 40,000 people protested over two days. That would mean that officers arrested .0003% of all protestors. By almost any definition, that is an extremely peaceful demonstration, and of course you are aware that the U.S. Constitution guarantees the right of peaceable assembly for a redress of grievances. So in the main, these people have done nothing wrong. 5. If I may provide you with a sense of history. You work in the largest and most magnificiently appointed state capitol in the nation, built by Bob LaFollette (a Republican). You work in the same building where Phil LaFollette (a Republican) helped guide Wisconsin out of the Great Depression. You work in the same building where Gaylord Nelson (a Democrat) was the first in the nation to offer rights to unions of state employees, rights that you now seek to overturn. And you work in the same building where Tommy Thompson (a Republican) provided more state funding to education than any other governor before or since. Are your current actions truly how you would choose to be remembered? 6. Finally, Governor, a note of thanks. Whatever the outcome of the next several days, you deserve a certain degree of credit. As an educator, I understand how difficult it can be to get young people interested in politics. You have managed to do this in the space of one week. A number of Wisconsin’s youth support you. A number of them do not. But whatever else can be said of you, you have them paying attention, and thinking about voting, and walking around the Capitol, and turning out to be involved. You have taught your own lessons this week, Governor, and that has its own value. While I recognize that the governor has many issues on his plate, I should note that I am still waiting for a response. Tip of the old scrub brush to Mother Jones, and Positively Persistent Teach.